(AUSTIN, Texas) 4.23.14 — Robert F. Smith, Founder, Chairman and Chief Executive Officer (CEO) of Vista Equity Partners LLC, will render Huston-Tillotson University’s Commencement address. Smith, an entrepreneur, philanthropist, corporate executive, owner of several patents, and founder of Project Realize, will speak on Saturday, May 10, 2014, at 8:30 a.m. during the convocation address on the athletic field located at 900 Chicon Street. Vista Equity Partners LLC, with an extensive software company portfolio, currently manages equity capital commitments of approximately $7.7 billion and is listed among the top private equity firms in the world. Smith also worked for Goldman Sachs, Mergers and Acquisitions, in New York and Silicon Valley, and Kraft foods, leading worldwide technical projects, for six years each. He founded Project Realize– termed “Free Market Philanthropy”– in order to combine the best elements of the American free enterprise system with the core American ideals of giving back and lifting others up. “The words of inspiration that Smith will impart upon the graduating class, their families and friends, will lay the foundation and motivate graduates entering the next phase of their career and graduate school plans,” said President and CEO Larry L. Earvin, Ph.D.
Smith earned his Bachelor of Science degree in chemical engineering from Cornell University (Ithaca, NY) and his Master of Business Administration degree from Columbia Business School (New York, NY). 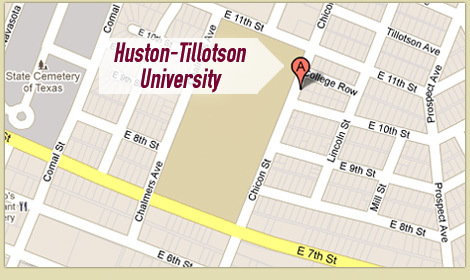 Commencement Convocation occurs in conjunction with Huston-Tillotson University’s Honors Convocation and Reunion Weekend 2014 activities. Honors Day Convocation, in recognition of students who have earned high academic honors, is scheduled on Friday, May 9 at 10 a.m. in King-Seabrook Chapel. Reunion Weekend activities begin on Thursday, May 8 at the Omni Austin Hotel Southpark and continue through Saturday. Registration and packet information is online at https://htu.edu/alumni/reunion-weekend-2014. In addition to the ceremony for the 2014 graduates, HT’s 50th year Class of 1964 will be honored at the graduation program and throughout the weekend festivities in addition to members of classes ending in 4s and 9s. For more information about Reunion Weekend 2014, Honors, or Commencement Convocations, call 512.505.3073. Convocations are open to the public. Event parking is available on Chalmers Avenue.